The data provide comprehensive regional data for a 28-year period, and will provide an important tool for further policy analysis. 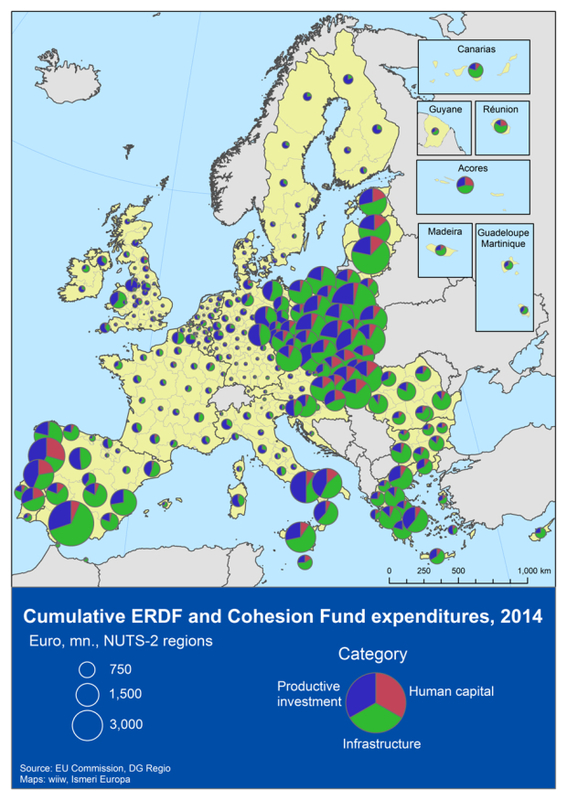 The EU Commission, DG Regio recently published the most complete historic European Structural and Investment Funds (ESIF) dataset to date, covering the years 1988-2016, four programme periods, 272 NUTS-2 regions and multiple funds. The dataset it now publicly available in the ESIF Open Data platform here. This data facilitates analysis of the effects of the EU funds, allows for testing and improvement of relevant economic theories, and increases our understanding of the mechanisms behind regional development. In terms of the regionalisation of EU payments made, the database expands and replaces datasets previous published on the ERDF and Cohesion fund with additional years and additional EU funds. "Geography of expenditure" Work Package 13 of the ERDF and CF ex-post evaluation 2007-2013. This 1998-2016 dataset provides the most complete historic picture available to date on the annual EU payments made under different shared management funds mapped to or estimated by NUTS-2 regions. The work undertaken to regionalise the payment data is predominantly based on the NUTS-2013 version as described in the final report of a 2016 wiiw study. If the EU funded programmes covered more than one NUTS-2 region, the regionalisation of the payments was carried out using either (1) regionalised data provided by the managing authorities or (2) the application of certain apportioning rules to the payments in order to estimate the share of the payment by NUTS-2 region. In regionalising the data, information on the specific national or regional funding programme, which were the source of the payments, was not retained in the processing of the dataset. The yearly breakdown of the dataset follows the cycle of the European Commission payments to the Member States and not the date on which real expenditures took place on the ground. This characteristic may negatively affect any subsequent analytic work to carry out policy assessments. In order to develop a more realistic estimate of the annual profile of real expenditure, the Commission tasked a team at the University of Bergen to undertake work to develop a modelling of the “real” annual expenditure on the ground, and to test the robustness and sensitivity of assumptions used. The final report is available here. Financial Data from Interreg programmes (ERDF) was not included in the exercise. The data currently covers payment made until end-2016. In future updates the Commission will a) add payments from later years (including from the programme period 2014-2020) and b) correct data or complete the data series for missing earlier periods (where possible).